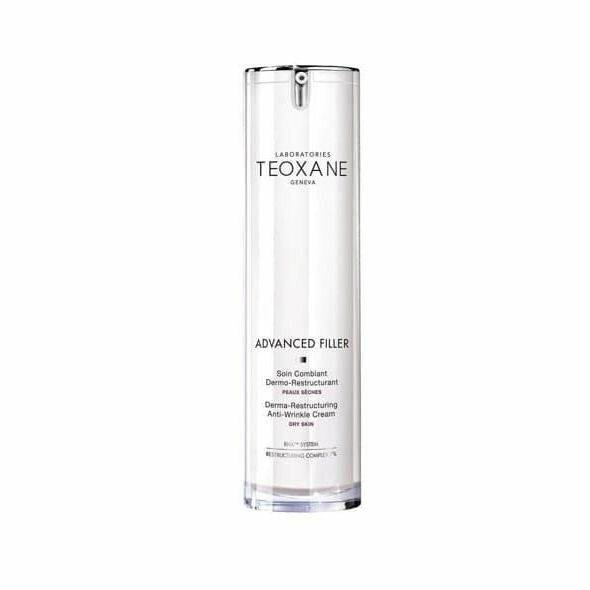 TEOXANE ADVANCED FILLER NORMAL – DRY SKIN – is a derma-restructuring anti-wrinkle cream that has been tailored specifically for Normal to Dry skin types. It has a luxurious texture to it, this daytime skin essential helps to promote immediate hydration and addresses loss of firmness. The exclusive combination of RHA and restructuring ingredients help to preserve and maintain lasting hydration while stimulating Hyaluronic Acid and collagen of the skin to visibly reduce fine lines and wrinkles. 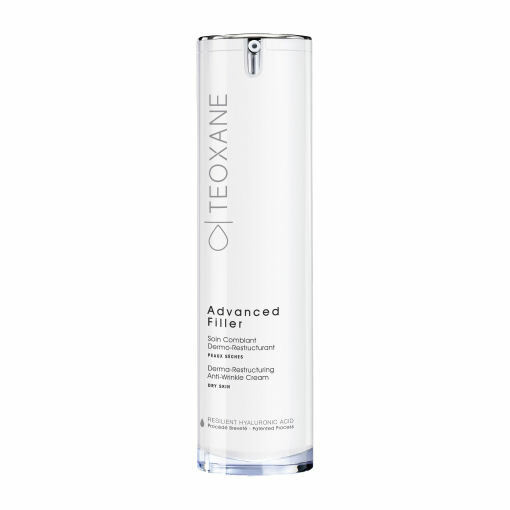 This Cream is ideal for those who would like to soften signs of a dull and aged appearance and nourish there dry skin. AQUA (WATER), GLYCERIN, BUTYROSPERMUM PARKII (SHEA BUTTER), LIMNANTHES ALBA (MEADOWFOAM) SEED OIL, PROPANEDIOL, DIMETHICONE, GOSSYPIUM HERBACEUM (COTTON) SEED OIL, HEXYLDECANOL, HEXYLDECYL LAURATE, JOJOBA ESTERS, CETYL ALCOHOL, GLYCERYL STEARATE, TRIETHYLHEXANOIN, POLYMETHYLSILSESQUIOXANE, AMMONIUM ACRYLOYLDIMETHYLTAURATE/VP COPOLYMER, MEADOWFOAM ESTOLIDE, OLEIC/LINOLEIC/LINOLENIC POLYGLYCERIDES, ETHYLHEXYL PALMITATE, PEG-75 STEARATE, BUTYLENE GLYCOL, PHOSPHATE BUFFERED SALINE, PARFUM (FRAGRANCE), SODIUM STEAROYL GLUTAMATE, BENZYL ALCOHOL, CYCLOPENTASILOXANE, CETETH-20, STEARETH-20, CHLORPHENESIN, DISODIUM EDTA, HYDROXYETHYLCELLULOSE, PEG-8, SALICYLIC ACID, DIPHENYL DIMETHICONE, CARBOMER, SODIUM LACTATE, SILICA DIMETHYL SILYLATE, TOCOPHEROL, POLYSORBATE 20, SORBIC ACID, DISODIUM ACETYL GLUCOSAMINE PHOSPHATE, PENTYLENE GLYCOL, SODIUM HYALURONATE CROSSPOLYMER-2, ASCORBYL PALMITATE, SODIUM NITRATE, SODIUM HYALURONATE, ASCORBIC ACID, CITRIC ACID, GLYOXAL, PALMITOYL TRIPEPTIDE-1, PALMITOYL TETRAPEPTIDE-7, GLUTATHIONE, PYRIDOXINE HCL, THIOCTIC ACID, ACETYL CYSTEINE, LYSINE HYDROCHLORIDE, VALINE, ISOLEUCINE, LEUCINE, THREONINE, ARGININE, GLYCINE, ZINC ACETATE, PROLINE, COPPER SULFATE, SODIUM HYDROXIDE.